Happy Horse Training offers a collection of dressage articles which address the reality of riding and training a horse without force, constraint and obsession with superficial appearances. This approach to dressage is based on developing the horse's INNER postural balance, instead of control that is rooted in the reins. 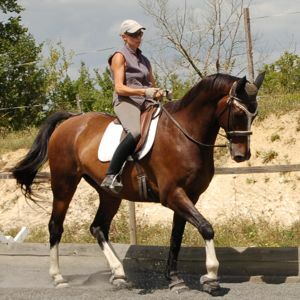 At Happy Horse Training, dressage has long been our inspiration for working with horses. 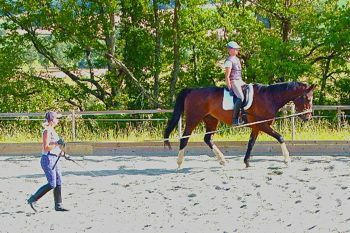 Our commitment to a pure, gymnastically sound form of dressage, with no compromises or short-cuts, has led us down a long road of learning about other aspects of horsemanship, in order to understand and address every aspect of the horse's well-being, so that the training has a sound basis of physical health and mental relaxation. This is why HHT has a holistic vision, but training horses remains our central passion, and that's why we want to share this through these dressage articles. 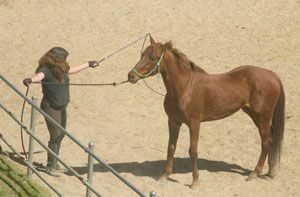 The pictures of our own horses working differ from the standard image of the 'dressage outline' for several reasons. Firstly, we have chosen to work with horses who are far from being the talented, athletic sports-horses that have become an almost obligatory requirement for any serious dressage rider. Most of our horses have basic conformational limitations, some are rescued, had previous injuries and/or behavioral problems. These issues limit the level of their training, but not the quality of it. They have all become increasingly supple, calm and enjoyable to ride over the years, which gives us the best proof of the validity of our methods. The second reason that many of the images in our dressage articles differ from those of commonplace dressage, is that we do not dictate the horse's head-carriage with the rein contact - either higher or lower, more or less round. Instead we allow it to be a pure function of the horse's postural engagement. 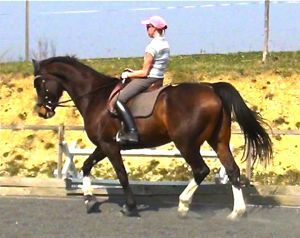 For horses who are limited in their natural conformation and innate suppleness, this often means a lower head-carriage than is usually sought in dressage. This may gradually come higher with years of training, but for some horses it will always remain fairly low when the ring of postural muscles is engaged. We are happy to accept this, because we do not prioritise appearances over the feeling of true balance without restraint, and the corresponding gymnastic purity. Above all, we do not want to block the horse's movement with a holding hand, as this is the best way to snuff out real transmission, and lose sight of the genuine level of postural balancing. It is our opinion that the horse's head-carriage is not actually a reliable sign of how correct the work is, despite the current fashion to condemn any work where the horse's nose is behind the vertical as bad training, and assume that any work where the nose is above the vertical as good. Horse's who are in early training, are postural weak, or have other issues, may well go behind the vertical in correct engagement, just as a horse with a high, above the vertical head-carriage can perfectly well be hollow in the back and disengaged behind. 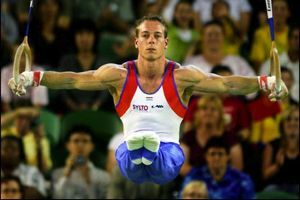 A far more reliable visual sign of gymnastic purity is whether the diagonals are parallel or not (see What Does 'On the bit' Really Mean? for an explanation of how to look at diagonals). Certain aspects of the riding position we advocate (explained fully in several of the dressage articles listed below) are also unconventional when compared to the traditional dressage riding position. 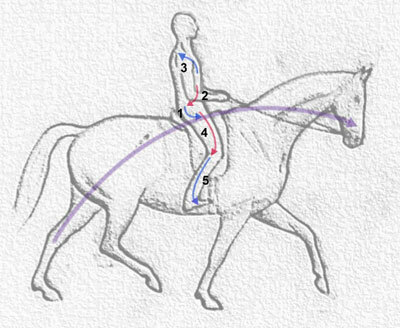 However, we have developed this position as a pure function of how the rider can best biomechanically influence the horse to promote postural engagement - the only way a horse can carry a rider in true balance, without restraint. This edition of the HHT Whole Horse newsletter discusses this question in greater detail: Handsome Is As Handsome Does. A description of our vision of dressage, based purely on the biomechanics principles that correspond to truly balanced, channeled and empowered movement, where horse and rider are connected in postural unity without force and restraint. 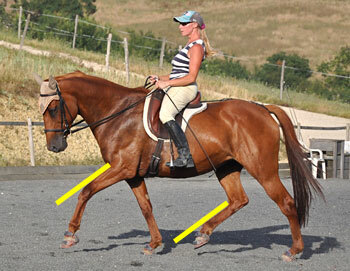 An explanation of this term, so commonly referred to in dressage, but so often misunderstood. In fact, it refers to the phenomenon of engagement on the ring of postural muscles, which is the corner-stone of our training method. This article explains a method of riding that addresses the age-old problem of how to ride a horse in balance. The Gymnastic Rider is an eBook that explains the way a rider must use their body in order to bring about the wonderful but elusive phenomenon of engagement. 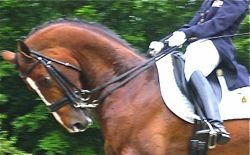 This dressage article explains the main principles of the unique way a rider must develop their position on the horse in order to generate postural engagement. A look at one of the most important and challenging elements of dressage training: developing straightness in both horse and rider. The physical, gymnastic influence of the rider's body on the horse is the number one concern in our philosophy of training. This article explains some of the most important principles. 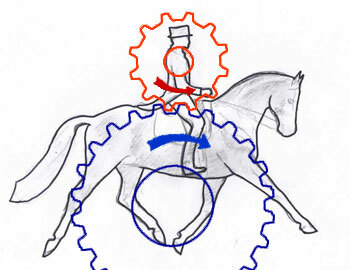 The seat is the lynch-pin of the rider's connection with the horse, but it can only fulfill this role when it becomes the rider's main fulcrum of balance, independent of the reins. When we sit on the back of a horse in movement, our body is subjected to considerable forces. The key to not only harmonizing with these forces, but channeling them into balance, is the posture. It gives integrity, structure and strength to the rider's body, allowing us to influence the much stronger and more powerful horse. An allegorical story which looks at the difference experiences that result from staying safe in order to prioritise surface appearances, and setting out on a true journey of discovery and development. 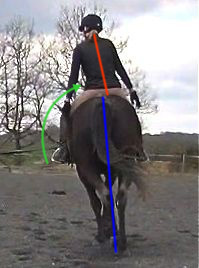 Natural dressage is a term that has come to mean a certain application of natural horsemanship techniques to obtain dressage movements. For us, however, natural dressage is simply real dressage: the gymnastic training of horse and rider without artifice or force. It is founded on relaxation instead of tension, and depends on the horse being given a natural lifestyle and holistic care. 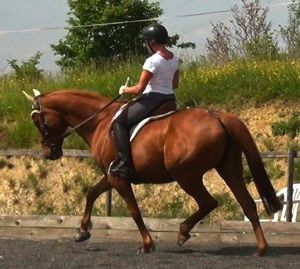 In dressage, double bridles have come to be considered as an essential piece of equipment, indeed they are compulsory at higher levels of competition. But are they really a necessary part of correct training? The rollkur training method, also known as hyperflexion or 'low, deep and round', has created one of the biggest controversies in modern dressage, but is there any real question as to the validity of this technique? This HHT dressage article gives tips that will help you to achieve what is so exquisite about real dressage: true engagement without force or trickery, that unifies you and your horse in freedom and balance. Both these disciplines are about training horses, and it could be argued that the difference is only in what we are training the horse to do. The real distinction, however, is much more profound. See also the training section of Happy Horse Training, which has many articles related to dressage: Training Horses, The Whole Way!